I’m not really a soda drinker, but last month when Cole and I went to see The King’s Speech (probably my favorite movie of the year… SEE IT) at the Americana in Glendale, I couldn’t help but notice the futuristic new Coke dispensers. Later I mentioned them to Mr. Tea– who is also quite the Mr. 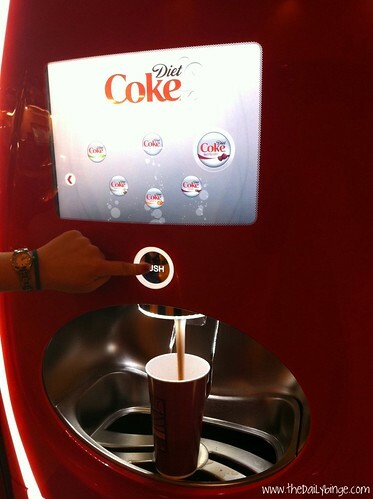 Diet Coke– and he was very excited to see the machines for himself. He’d heard on a TV special that Coke actually tracks which drinks people are selecting on the machine, and uses that data to decide which flavors to sell in grocery stores, etc. Several people selected Raspberry Coke, only to pour it out because it tasted like medicine. So… if you’re the data-collector at Coke, maybe don’t release the Raspberry Coke. Your data is skewed. 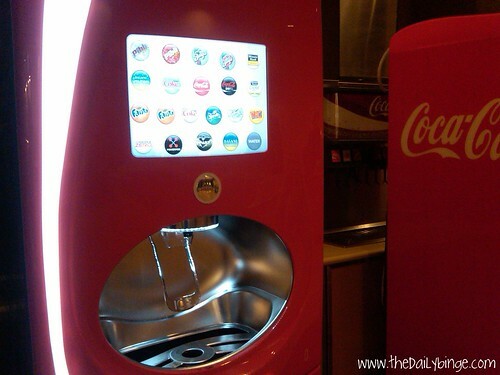 My favorite part is that because the machine has so many options (various flavors of Sprite, Fanta, Coke Zero, etc), the syrup and the soda water are blended as it pours. You can see the separate syrup stream in the photo below. That's my hand! And the not-so-good Raspberry Coke. In the end, most of our group went for the Vanilla Coke (or Diet Coke, Coke Zero, etc), because it’s still somewhat of a novelty– and has a subtle enough flavor that it’s drinkable. Due to our movie theater locale, the drinks were $4 for a small. But I’ve heard that these machines are turning up in other parts of LA… keep an eye out.